Next Tuesday I'll be starting the first of two workshops on soap making at my local Neighbourhood Centre. The classes are booked out, twice. Last weekend, I decided to make a batch of soap so that those participants on the first day will have a bar of soap to take home with them. I also wanted to go through the procedure and focus on the important parts of the process. I decided to change my recipe. I have found that coconut oil has been harder to come by recently, and it's expensive, so I made this batch using 250 grams/one cup of Copha, which is the solidified coconut oil you can usually buy quite easily at the supermarket. To make up for the reduced amount coconut oil, I added more olive oil, so I got more of a castile-type soap that should be very good for the skin. Another change was new moulds. I asked Hanno to keep his eyes open for some soap moulds, I rarely go to the shops now, and he came home with some excellent choices. I made four roses, 4 long bars, and 12 small rounds. I stamped all of the bars the following day before they became too hard to impress and I'm very happy with all of them. BTW, these moulds are silicon cake moulds. 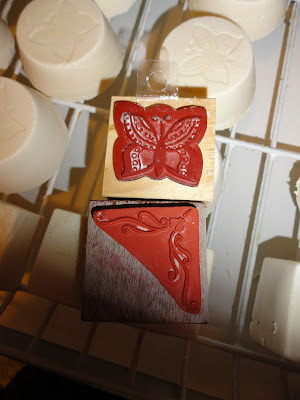 I use ordinary rubber stamps to impress my soap. Making soap and other general cleaners, will stop you buying all those expensive, harsh chemical cleaners you find in that long stinky aisle in the supermarket. Add that to the bread you bake at home which is cheaper than the expensive bakery-style breads, the yoghurts, ginger beer, jams, sauces, fresh cheese and all those meals cooked from scratch and you're beginning to see real savings at the supermarket whenever you shop. There is no doubt about it, putting the time in a home to make much of what you use will save you money, make you more self reliant, will reduce the number of harsh chemicals, preservatives and colourings you have to deal with, and will enrich your life in the learning and supporting of those old skills. Copha 250 mls Copha comes in a block that is melted when you heat the oils. Here is a liquid conversion calculator to convert those metric amounts to fluid oz. Here is my soap making tutorial. I used the same method to make my soap. 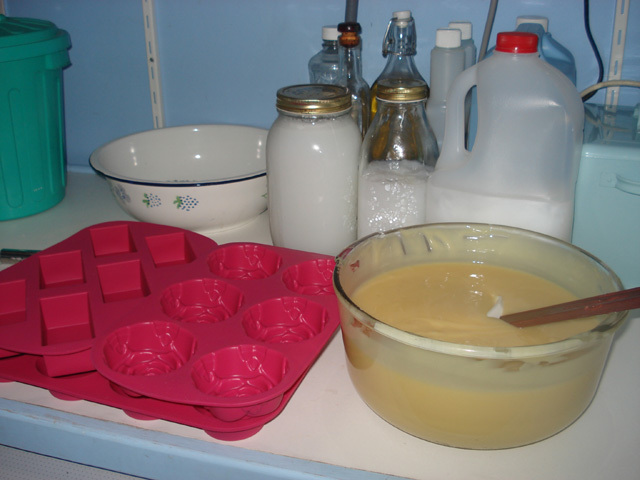 The various oils used in soap making are chosen for their specific qualities. For instance, olive oil and rice bran oil are used for the creamy soap they make as well as being very good on the skin. Coconut oil hardens the bars of soap as well as giving a good lather. I choose to make a simple soap. I don't like adding colours or fragrance, I like plain, plain, plain. 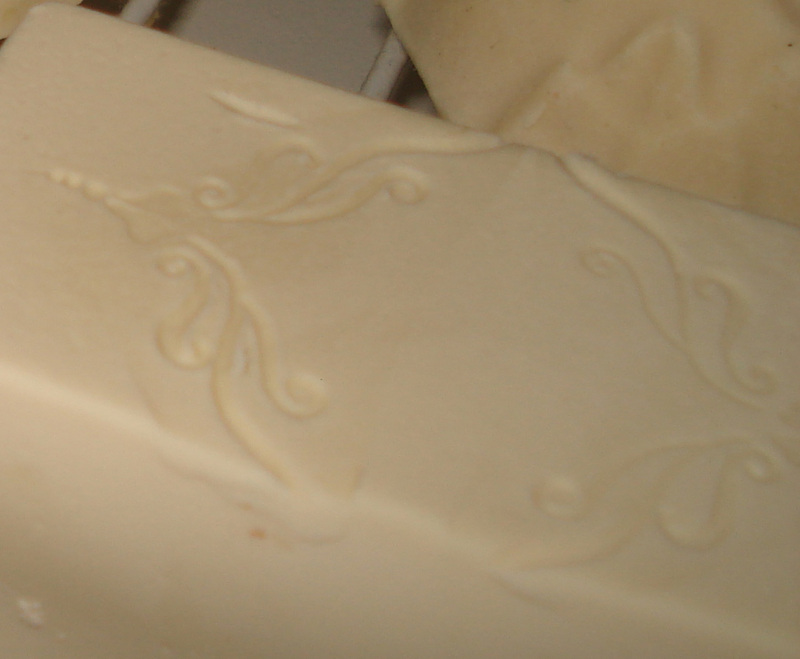 I want soap that is good for my skin and cleans well, if it looks like the good French bars of soap, that's a bonus. However, it is certainly possible to add colour and fragrance to this soap, and you can find out how, here. I'm looking forward to my soap making classes. They will bring more people closer to self reliance, they will help maintain and add to the knowledge base of traditional soap making and they will help build my community. I already know that some of those people who attend won't have met each other, but through these workshops, they may forge friendships that last a lifetime. Bringing like-minded souls together is a powerful thing. I hope you're making soap and your home supplies of bread, jams, sauces, laundry powder and all those other things that are easily done at home. If not, maybe this soap is a good way of starting. "Copha is not readily available here, but I have found a fairly inexpensive coconut oil at many Wal-Mart stores. It's LouAna brand, located in the cooking oil section, in a white plastic cannister with either a brown or a green lid. It's not organic, but it only costs about $5 or $6 dollars for 31.5 ounces. It's about half the price of what I had been paying for coconut oil at the health food store. I use it for both soap making and for cooking." I love it! I made my first soap recently and it's just magic. I've wizzed it in the food processor, added soda crystals and it has cleaned the oven, the floor, the windows, the laundry. The bars of soap are lovely on our skin too. I don't think I'll every buy soap again. good morning rhonda, like you i make my soap plain, using for body, shaving, shampoo. there seems to be an abundance of soapmakers at fairs etc now but they are all highly scented. people dont seem to be aware of how these scents in soaps, home fragrances etc are damaging. "perfume pollution" something to make people aware of. I took a soap making class here in northern CA a year and a half ago and just loved it. The recipe she gave us included lavendar, lemon and a few other ingredients. Apparently I'm allergic to one of them because after two months of using the soap, I finally figured out that that's what was giving me a rash! When she gave us the recipe, she told us it was gentle enough to use on a baby and I didn't think anything of it. I haven't made soap since but if I do again, I'll make the plain as you do. 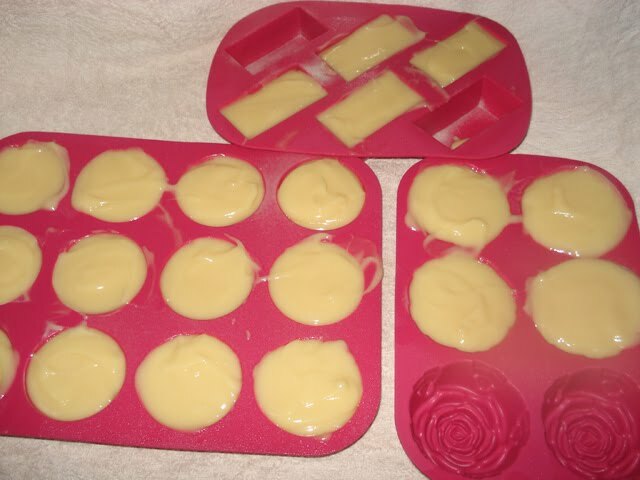 Are your molds specific soap molds or can you use silicone molds that you would use for baking? your soap looks beautiful! Thanks! I haven't made soap yet, but I'm going to start next month! I plan on making both the solid and liquid, although I am starting with the solid first. I'll let you know how it turns out!! Good morning ladies. Wife of a dairy man, they're cake moulds. Thanks for mentioning that, I've now added it to the post. Your soap is very beautiful. I have been meaning to make soap for ages and you have remotivated me! Every time I think I'l make myself some someone gives me a lovely handmade bar so I put it off again! I´d love to give soap making a go. If I can get my hands on Lye that is. As strange as it might sound the only ingredients in the soap recipe that are readily available where I live are water and olive oil. Rice bran oil I have never seen nor copha. Coconut oil is available in a solid form in the organic section of larger shops. I´ts pricey to say the least. 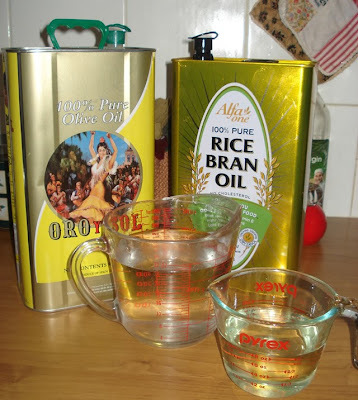 What would you suggest I used instead of Rice bran oil? And would it be possible to use hardened vegetable fat instead of the copha stuff. You know the one you use for deep frying sweet things? Or should I be a princess and use the expensive stuff? Kristin, use low grade olive oil, not organic or first press oil, it gives a better result. You could use just olive oil and coconut oil, which you might find at an Asian shop. Or you could use olive oil and castor oil. You need that second oil because using olive oil alone will give you a soap that won't lather much. Google a soap calculator that you can understand and put the oils you choose through the calculator to give you the amounts of lye and water you need. Good luck. I had to giggle when you wrote 'stinky aisle' - that's exactly what my kids call it. "Pooh! The stinky aisle!" And they pinch their noses the whole way down the aisle! We don't use a whole lot of commercial cleaners and the ones we do use aren't perfumed so I think all that fake fragrance is a shock to their systems! I've just bought some caustic soda and am gearing up to make soap for the very first time. Thank you for another delightful blog entry! I am thoroughly enjoying your blog, from far away in Alberta Canada! The frugal and simple life is a new one for me and my little family, and I am very dependent right now on input from wiser, more experienced ladies like yourself. Blessings your way! 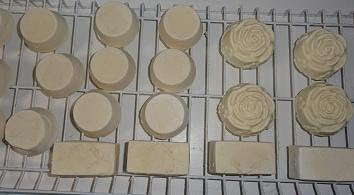 I made soap about 2 weeks ago using your recipe Rhonda it seems to have turned out fine, it lathers up nicely and does not leave the skin dry at all. The only thing I found was that it went a bit grainy/mash like quite quickly instead of the custardy consistancy which I didn't expect. Instead of using a hand whisk or mixer I just used a spoon. Because of this it didn't settle in the molds as well as I would have liked. Also I used KTC 100% coconut oil priced at £1.19 for a 500ml jar from the Asian shop, from Holland and Barratt it was nearly £12.00 pounds? There must be a reason for the price difference? Do I have to use rainwater or can I use distilled water? I really like the idea of making my own soap, especially since my girls have such sensitive and delicate skin. If I might, Rhonda, I wanted to add an FYI for your readers in the US. Copha is not readily available here, but I have found a fairly inexpensive coconut oil at many Wal-Mart stores. It's LouAna brand, located in the cooking oil section, in a white plastic cannister with either a brown or a green lid. It's not organic, but it only costs about $5 or $6 dollars for 31.5 ounces. It's about half the price of what I had been paying for coconut oil at the health food store. I use it for both soap making and for cooking. Oh, I wish we lived closer as I'd love to attend some of your workshops. Nothing like a hands on class to get one really motivated. I have been having trouble with the chlorine chemicals they put in the water here and have had to resort to bathing with one of those chemist only treatment to stop my skin itching. So now we will be putting in our rain water tanks very soon and I will make your soap and my skin will get back to normal. Thanks for the recipe, its good to read all the comments and realize so many people are moving back to a simple lifestyle where they are in control and not the supermarkets. I wish you well with your workshops. I am reasonably local to you, and would love to attend one of your workshops if possible. How do I find out where/when they are on next? Many thanks. This is my fall project, making soap for the first time. However i am having the most difficult time finding rice bran oil. I finally found coconut oil, after going though about 20 stores and the lye came from the farm store ( go figure). I am looking forward to making soap. Wish i could get lessons here. I agree! "That long stinky aisle"-- I actually hold my breath if I'm forced to walk that aisle for any reason. I have asthma, and synthetic perfumes really bother me, whereas natural fragrances do not. I only buy fragrance free, eco friendly soaps for my bath and my house that are local to New England. Someday I will make my own. Thank you for inspiring so many to do so much with our lives, I learn a lot, and also remember a lot that I'd forgotten about, growing up with a simple farm life. I moved to the city and made things complicated. In the past few years I've simplified again. I love coming here and learning new things on this blog! Thank you so much. I love making soap! My first attempt I made up a recipe to use the stuff I had on hand with a lye calculator and used your tutorial. I always use goats milk for my soap and freeze the milk for a few hours and add the lye over an icebath. This keeps the fats from burning and turning orange. I am happy that I made some soaps for my mom to use as she is sensitive to EVERYTHING and has asthma issues in addition to rosacea. No wonder she gave up on soaps. She is even allergic to borax! I keep trying to make her the perfect soap and every recipe I create is a little different. Thanks for igniting my spark! Also I used KTC 100% coconut oil priced at £1.19 for a 500ml jar from the Asian shop, from Holland and Barratt it was nearly £12.00 pounds? There must be a reason for the price difference? Captain Shagrat I use the exact same coconut oil with no problems. I think the reason for the price difference is that in asian shops it is a staple and priced accordingly, whereas holland and barratt are pricing it for wealthier 'picky' 'health conscious' 'organic' consumers (no offence meant, as I'm one too, but also on a budget!). H+B have a captive market on the high street for this type of thing, so they can get away with it. They do the same with all their health supplements which are twice what the are elsewhere, ditto dried fruits/nuts. I only use them for vegetarian 'specialities' I can't get elsewhere. @ Captain Shagrat - according to the tutorial I think you're supposed to leave the soap to cure for at least 6 weeks before use or else it will disintegrate too quickly - as you've already found out! Thank you for the recipe, Rhonda. I will give it a go now - have been procrastinating due to fear of using caustic soda...I am on the look out for moulds & stamps from op shops. Have you costed the soap made with this new recipe? Thank you, thank you, thank you for this post on soap! I was actually hoping you would do another one on it soon as I'm going to be taking the step of making my own liquid/bar soap. I make all my cleaners now except soap- it seemed a bit intimidating to me...but when I decided to give up commercial cleaners for good, that meant commercial soap. The cake molds are a great idea- so pretty! They would make wonderful gifts. You'll also find tea tree oil at walmart for $5, instead of the $12-$22 at health food stores!! Thanks for the info lightisfading an asian friend at work went out, of his way on his dinner hour to get me that 100% KTC coconut from his local shop, he was astonished that it was so expensive in Holland & Barrett. I wasn't going to make it if I had to pay 12.00 quid so I was glad my friend Faz came up with a much cheaper alternative. Drllee thanks for comments but I only tried one small bar after two weeks because I was curious;-). The other blocks are safetly curing away, gonna leave them for another 5 to six weeks. Another friend gave me some Ph testing sticks which I used on the one testing block and it was too high at 11. Well done Rhonda and Happy Birthday to you, Hanno. I am glad you like the silicone molds. I really like the long bars. It is a good reminder to find local oils but as a caution if the oils are changed from your recipe the recipe should be run through a lye calculator again to be on the safe side. Each oil has their own properties and require different amounts of lye. There is nothing more dissapointing than to change a recipe, not check it and have "ucky" soap. A waste of time and $$. Ask me how I know this? ...The wife of a Dairyman...I would guess it is the lemon that is giving your skin the trouble. You didn't mention all the ingredients but if you like the base recipe try adding the essential oil one at a time? You might be able to figure it out? A single batch divided then the essential oils, just 1 in each should let you know? Just a thought. A happy dance with the news of your book! Oh, that soap is so beautiful! I've only made soap once and would love to make it again. I recently made the soap from your first tutorial and it went smoothly and I got to the trace stage in the right sort of time.. but the soap was still stingy by the time I put it into the mould. I cut it up the next day and it still had a 'bite' to it. Will this soap be any good to use? Does the sting disappear eventually or have I put too much lye in it or did I not mix it enough? Can I do anything with it if it isn't any good? Re- batch? Help! It feels like such a waste of ingredients. Oooh, great idea about the silicone moulds. I never knew you could use them for soaps. I normally use a plastic Ikea Antonius tray, which gives me "loaves" of soap to slice up. As they are the cloths used to clean the dishes, pots and counter tops, etc. how do I "bleach" them without using bleach? Seem to recall you mentioning an "oxygen" cleaner - could you please be more specific. Anyway, I have this favorited for that time! After having made the laundry liquid 2 weeks ago, I gave your soap a go this Saturday. They are now drying and I look forward to using them. I´m excited to be making all these natural cleaners, as I hardly ever buy chemicals and I just hate to go past the stinky aisle in the supermarket as well, it makes my eyes water and my nose itchy. Thanks for all the lovely green recipes. I found your blog while looking for a rice bran soap recipe. I use the rose mold that you do, as well as a couple other silicone molds. I enjoy fragrance in my soaps, though. I can't imagine using regular commercial soaps again. They are so bad for my skin. Thanks Rhonda, I will try this again soon. Tried it once based on your inspiration, but to be honest the scary chemistry calcs scared me off when I tried to use a calculator... I have not heard of copha here in the UK, so will try to make soap with olive and coconut oil instead, maybe some shea butter too. Also for UK readers, Lakeland have some amazing cake/chocolate moulds now (silicone) that are awesome for soap. I made some melt and pour soap last weekend and their £1.99 4xmini loaves silicom mold set worked wonders. Thanks again. I have been enjoying reading your blogs for a few months now and it would be unfair for me not to acknowledge how much I am learning from it. When I started searching for green cleaning recipes I stumbled upon your blog and I am glad I did. Since then I have been replacing my detergents, adding value to my homemaking and spreading the word. I have even passed on your details to few other friends. At the moment I am psyching myself up to make soap. Fingers crossed I will be by the end of this month, thanks to your straightforward instructions. Thanks once again and keep up the good work!